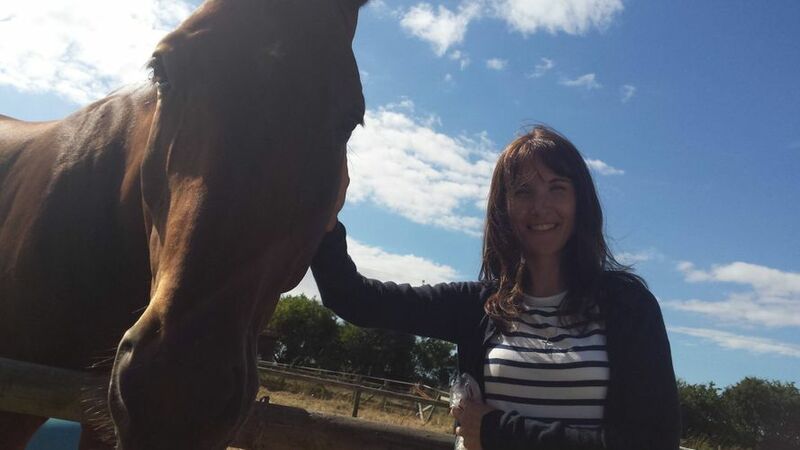 Debbie is an Accessible and Dementia Tourism Officer in her day job, as well as a racing fan. 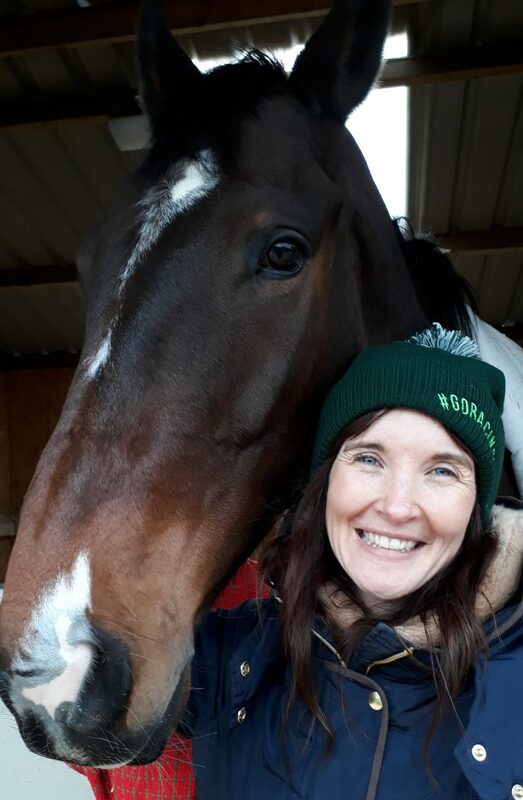 She is therefore well positioned to offer an insight into her experiences going racing, and thoughts on some small changes that could make a big difference to a significant number of people. “I think that when you live with mental health conditions, such as depression and anxiety, you often feel very alone. In some cases you feel there is no one to talk to, and as I have often experienced myself, when you do talk to people they either make light of it or simply don’t get it and you feel extremely alone. I found I actually stopped talking to people in the end, which can have a further negative impact on how you are feeling. 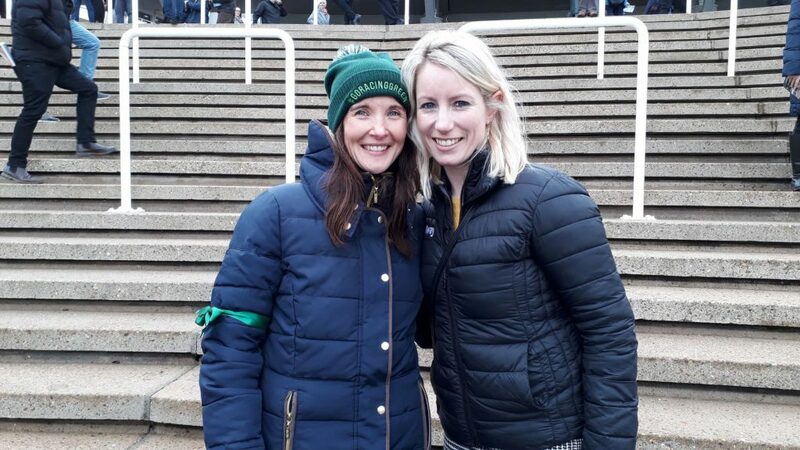 I have been really touched by the amount of people that have replied to my tweets, sent direct messages, emails, and those who came up to me at Cheltenham and shared their experiences. 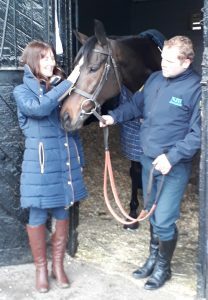 I never imagined that tweet I sent ahead of going to Ascot – to see Altior run for the first time – would lead to where I am now. Now #GoRacingGreen has started, I really want to keep the momentum going and help as many people as I can and get people talking, as well as hopefully helping those suffering from social isolation, too. The challenge before I go racing is the social anxiety itself, and the phobias I have which are with me at the start of every day. I haven’t been to many courses as yet, but as someone that suffers with social anxiety I don’t like crowds and busy places. I feel quite intimidated by large groups of people, especially when alcohol is involved. I am also quite short which I find doesn’t help as it is easy to get nudged along! I like to sit outside by the parade ring, I feel safer being outside as I suppose I feel I can easily get away if I need to. Also, when I am on my own I feel like I am drawing less attention to myself sat outside than if I were to walk into one of the bars on my own, for example. I did have a quick look inside at Ascot but quickly became quite panicky and didn’t feel that I could have got a drink or something to eat if I’d wanted. I bought a coffee from one of the catering vans just inside the entrance and drank it at the parade ring. I have never been inside at Cheltenham and when I went to Chepstow I was kindly offered an Owner and Trainer’s pass by the course and Fergal O’Brien offered me use of his box, if I needed it to get away. I think for people like myself, people who are alone, have anxieties, it is firstly really important to know that we will feel safe and comfortable in any environment. Secondly, it isn’t easy going places on your own where, in general, people go with other people. You do feel really out of place. My aim with #GoRacingGreen is to put measures in place to turn all that around hopefully, so more people can get out, socialise and enjoy the racing. I did a presentation recently at a Tourism Forum hosted by Marketing Gloucester, Visit Cheltenham, Cotswold Tourism and Forest of Dean & Wye Valley on Dementia Tourism and Hidden Disabilities. I was amazed at how many of the delegates came up to me at lunch and said they have access statements – as in for people with physical disabilities: detailing lifts, level access, disabled toilets, but had never even thought about the hidden disabilities! In the UK 850,000 people currently live with dementia – these are stats for those officially diagnosed, and there are many more who have not yet been diagnosed or sought help. A staggering 12 million people in the UK live with an activity-limiting condition. We know that one in four of us at some stage in our life will suffer with mental illness, be that short or long term. Actually, putting measures in place for those with ‘hidden’ disabilities are in general much easier and much less costly – for example, if you have a spare space that you can allocate as quiet room, it costs nothing in comparison to fitting ramps, adapting toilets, etc. The list of things that can be done is endless, and very much depends on each individual business and working with the facilities they have already – looking at ways they can be used to make a difference, rather than expecting them to spend money on adding facilities. In the work I have done with physical accessibility assessments, and when I was in the working group that produced VisitEngland’s Accessible Destinations Guide, it was really interesting talking to disabled people and hearing how many business access statements don’t actually work in practice. For example, they may have a lift and a disabled toilet, but don’t think about putting ramp access into the building, meaning any facilities they have inside become irrelevant. Often with businesses I have worked with on physical access statements, I have invited people in wheelchairs to come with me – although I am qualified to assess a business and write an access statement, I cannot possibly see it through the eyes of someone who is physically disabled as I am able-bodied. I guess having the social anxieties and phobias I personally live with every day allows me to do the hidden disability access statements, including writing sensory guides, as well as doing the assessments themselves. My work alongside the Alzheimer’s Society as a Dementia Champion and talking frequently to people living with dementia has given me a good insight into some of the challenges. If we are talking quick priorities, then this would be a quiet room or a safe place, though this should come with one or two trained staff, as a Dementia Friend, for example. It’s important to recognise and assist people that may need to use this space; sympathetic advertising of the facility will also make things more welcoming. Again, what each course can do I imagine will be very different and in relation its size and facilities, but I have no doubt that each one would be able to do something. Excuse the pun, but it’s about creating a safe place in a stable environment! I only ordered the green bobble hat quickly so people would recognise me at Cheltenham that day. I didn’t realise there would be a demand for them! I have also asked my Twitter following what else they think would be a good idea, as I know hats aren’t everyone’s thing, and pin badges came back as the most popular as these can be worn on a hat, tie, lapel, etc. 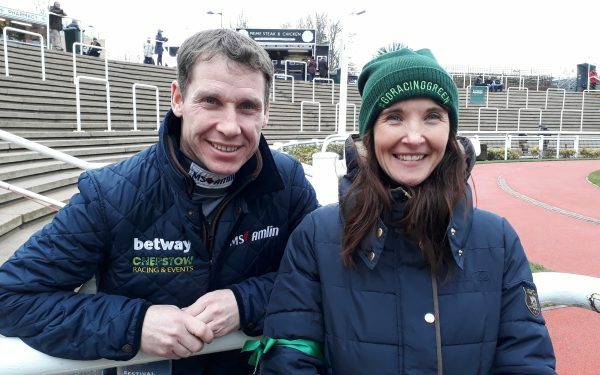 Trainer Tom Lacey has offered to sponsor the first batch of merchandise, which is amazing, and proceeds from sales will be split between two charities. I am currently looking into suppliers and also which charities, but one will be equine-related and one related to mental health. #GoRacingGreen next goes to Ffos Las on 7th February. They are very keen to work with me to make Ffos Las and Chepstow as accessible as possible on all fronts, as I think the smaller courses do rely a lot on local attendance. They have kindly invited me to go along and experience a race day there and are fully supporting the campaign. Hereford Racecourse have kindly offered a sponsored race title for #GoRacingGreen on Monday 11th February. The race is the 3:20 and they have invited me to present the prize, and are even including a feature on #GoRacingGreen in the racecard. Obviously, I can’t get to every race meeting, so the idea of the green ribbon initially was to get people talking, so if someone is on their own and wants to go racing, they will know there are people there with whom they can speak. I felt really alone at Ascot that day, no one even said hello or passed the time of day with me and it would have been nice if I had known there may have been other people there willing to talk. That’s what this initiative is all about and I have seen people on my Twitter feed looking to meet up and go racing as a result, which is just fantastic.